MC 3100 - Maximize performance! 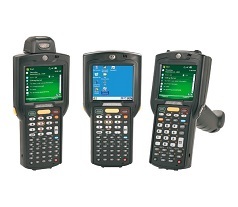 Building on the successful MC3000, the new Motorola MC3100 Series brings cost-effective mobility and user comfort to key-based applications within the four walls. The rugged and ergonomic MC3100 offers advanced computing power and data capture capabilities, enhanced security and enterprise class motion sensing capabilities. And compatibility with existing MC3000 accessories provides a seamless upgrade path to the latest in mobile computing.